3D space may have some curvature. Sfera helps to realize that. 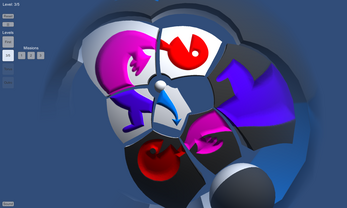 Sfera is a sliding tile puzzle game (like the classic 15 puzzle). But its space is curved. So its board has no bounds and is closed in itself. Click to slide a tile. Mouse wheel to evert the space. Each puzzle level is initially solved. Just explore it at first: spin it, mess around, reset. Then choose a mission (it shuffles the tiles) and try to reach the initial state manually. Next level becomes available when 2 of 3 missions are completed. GPU required: Shader Model 3.0 (with Vertex Texture support) e.g. DirectX 9.0c. Windows and Android versions have the sound. The present 3D space has constant positive curvature (becoming by stereographic projection of 4D sphere). Each game level has a 2D surface (currently sphere or torus) defined in that space. The surface is devided into tetragonal cells to place tiles inside. The cells are subdivided into smaller parts to define coordinates for sliding tiles smoothly. Geometry of tile vertices is calculated in a Vertex Shader. 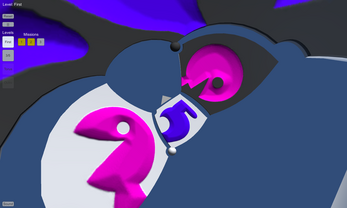 Coordinates of subdivided cells passed to the shader using Vertex Texture. 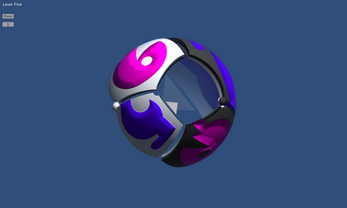 The shader basic functionality is opened on Asset Store. Windows: No installation needed. Just Sfera.exe (and Sfera_Data folder). Android: No special requirements needed.